A perfect and sumptuously equipped, exclusive villa, offering a relaxing al fresco lounge area overlooking the private swimming pool. This residence is absolutely exceptional with all modern amenities. 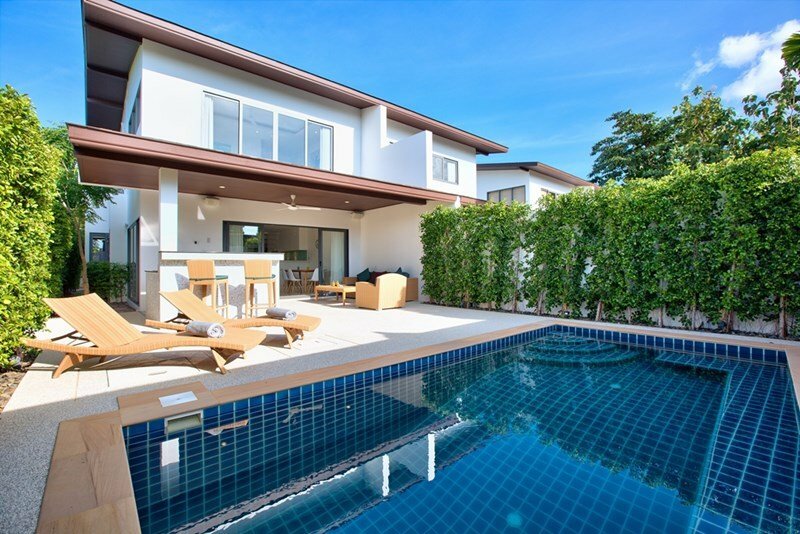 This stunning 2 storey modern, contemporary villa, 3 bedrooms, 3 baths, (sleeps 6 maximum), private swimming pool (3m x 6m) and outdoor living area and bar, is Ideal for large families and friends to make memories last a lifetime. Enjoy the exquisite tastes of Samui or your own selection of feast, created with the freshest ingredients and finest of dining, in the privacy of your own villa. We offer a selection of order-in food menus, the option for Personal Chef or full service catering and BBQ. 3 Bedrooms, sleeps 6 comfortably. Each bedroom is completed with contemporary matching furniture and built-in wardrobes. All linen and towels (with the exception of beach towels) are supplied. 1 King-size Bed, Built-in Electronic Safe, ceiling fan and air conditioning, en-suite bathroom with rain shower. 1 Queen-size Bed, ceiling fan, air conditioning and en-suite bathroom with rain shower. Twin Single Beds, ceiling fan and air conditioning. Separate bathroom with rain shower. Ground Floor/Poolside Chilling Area with Bar: Shaded seating area with rattan sofa, coffee table, armchair and bar stools, overhead fans fridge, sink. support in English, Thai, Japanese, and Russian. Personal Concierge service available for your holiday needs. Our Exclusive Concierge team can provide you information and book all tours and activities.. Private tours can also be arranged. Private and public boat charters with diving, snorkeling and sunset excursions available. Car and bike rentals can be arranged prior to arrival on the island. Car rentals with or without chauffeur drivers available. *Car rentals are inclusive of full insurance coverage, motorbike rentals are not insured. NB Electricity is charged at the local Government rate of 6 THB per unit. The average cost is 600 THB per day, depending on how long the air-conditioning and fans are left running.